Will the Real Educational Conservative Please Stand Up? No one can say Michael Petrilli doesn’t understand educational conservatism. As head of the free-marketeer Fordham Institute Petrilli has long championed aggressive conservative activism in schools and educational bureaucracies. In a recent piece at National Affairs, though, Petrilli tries once again to impose an ill-fitting definition of “conservatism” onto America’s educational landscape. This strategic attempt at a flattering self-image for conservatives might help conservatives sleep at night, but it doesn’t fairly depict historical realities. This isn’t the first time Petrilli has tried and failed to convince conservatives of what they should think. A few years back, when then-new Common Core State Standards reared their heads, Petrilli struggled to convince conservatives that the Common Core was conservative. He failed then and he’ll likely fail in his current attempt as well. that parents should be able to choose schools for their children that match their educational priorities and moral values. This principle stems from our deep respect for the family as the building block of a free society. If we care about economic growth, upward mobility, and strong families, we should make improving America’s educational outcomes a priority. Education is both a private good and a public good, and a society has a legitimate interest in the education of its next generation — the more so when public dollars pay for it. In short, Petrilli is hoping to convince conservatives that they should work to improve public schooling for all. He wants conservatives to see themselves as the true guardians of American values and prospects, the side of the future. If we could all agree on improving public schools for everyone, we could likely skip much of our culture-war shouting and have drinks together on the patio. The problem is that Petrilli’s flattering definition of educational conservatism doesn’t match reality. Conservatives view upward mobility as a key objective of social policy, and want to empower poor families to choose schools that can catapult their children into the middle class. Now, I’m happy to grant that Mr. Petrilli himself truly values such things, but it is more than a stretch to say that such lofty social goals have ever been a primary motivating factor for conservative educational activists. 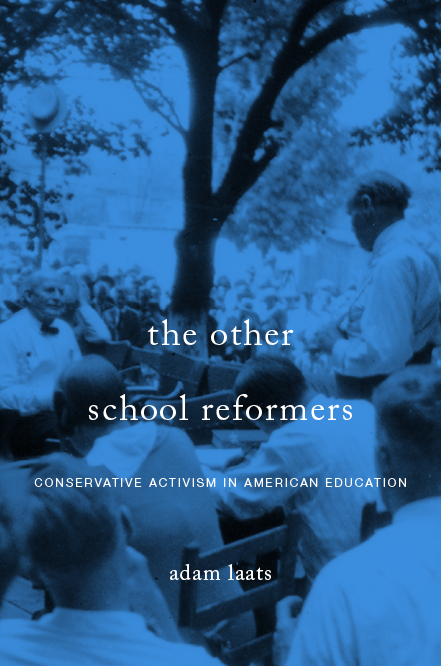 As I argue in detail in my book about educational conservatism in the twentieth century, the primary goals of conservatives have been starkly different. From Grace Brosseau of the Daughters of the American Revolution to Norma Gabler of Longview, Texas; from Homer Chaillaux of the American Legion to Max Rafferty of California’s State Department of Education; from Bertie Forbes to Alice Moore…conservatives have wanted a bunch of different things out of schools, but elevating the economic prospects of “poor families” has never been their primary motivation. Educational conservatives have insisted, in short, on two central ideas. First, schools matter. Conservatives, like their progressive foes, have rarely questioned the notion that the schools of today generate the society of tomorrow. Second, because schools matter, their content and structure must be guarded ferociously. Ideas that challenge inherited wisdom must not be crammed down the throats of young, trusting students. And teachers must not abdicate their roles as intellectual and moral authorities. Educational conservatism, in other words, has been the long and vibrant tradition of defending tradition itself in America’s schools. Of course, Mr. Petrilli is happy to offer any definition he wants for conservatism and his fans are welcome to agree with him. The rest of us, though, should understand that educational conservatism has been mostly about protecting kids from progressive trends in school and society. And that leads us to Petrilli’s second big goof. Much as he might dislike it, school “choice” has never been anything but a convenient tactic for conservatives. Most conservatives have been decidedly blah about the notion of school choice unless that choice seemed like the best way to achieve their real goals of insulating their kids. If we need proof, we don’t need to look any further than the mottled history of the idea of school choice itself. When Nobel laureate Milton Friedman proposed the notion of charter schools back in 1950, it met with a profound fizzle. Conservatives back then—everyone back then—mostly ignored the idea, as Friedman himself admitted. It took nearly fifty years for conservative activists to embrace school choice as their number-one go-to plan for saving their kids from America’s schools. And even then, notions of school choice often take pride of place only in the wonky visions of brainy conservatives like Petrilli himself. Many more conservatives these days look instead to their traditional havens of private schools and the exciting new world of homeschooling. Looked at one way, Mr. Petrilli might be right. The world of educational conservative activism might really be split in two. The sides, however, aren’t the ones Petrilli imagines. Instead of a split between conservatives who are happy with expanding charter schools and conservatives who also want to improve public schools for all, it might really just be a split between idealistic conservative reformers like Petrilli and almost all the rest of the conservatives out there. I like Petrilli’s view of conservatism. If that’s what “conservatism” means, then I have been a life-long conservative. Oh, in those terms, the academy is full of conservatives. They are the dominant voice. But somehow that does not work with the way “conservative” is used today. I’m not sure I see a conflict between the idea that schools matter, and content and structure should be guarded ferociously, and that “upward mobility [is] a key objective of social policy” and “[conservatives] want to empower poor families to choose schools that can catapult their children into the middle class”. First, what is “conservative” at one time is not always conservative in another. Some of the things that liberals believed in the early 20th century would be very un-PC today, and some of the things that conservatives believe today would have been heresy back then. Culture and politics do evolve over time. So I’m not sure how valid it is to say that someone spelling out conservative values today is being disingenuous or somehow clueless about his own ideology, on the ground that what he says conflicts with things that were held by conservatives of an earlier time; any more than someone who speaks of legalizing drugs as a progressive cause is being disingenuous about his progressivism, on the ground that progressivism once endorsed Prohibition. Second, it is true that conservatives want to empower poor families to choose schools that can catapult their children into the middle class. As a conservative I want that, and modern liberals in general don’t. I mean sure, liberals want poor families to *have* schools that can catapult their children into the middle class; it’s the “choice” part that seems to stick in their throats. Given that this does seem, empirically, to be where the two sides line up, are we to say that one or the other, or both, are betraying their ideological heritage? Or is it possible rather that the two sides have shifted or evolved over time, as is to be expected? It’s fallacious to argue that because conservatives traditionally have opposed liberal policies having as their purpose raising the poor out of poverty, that therefore conservatives have opposed raising the poor out of poverty. Opposing certain ways of reaching the goal, doesn’t necessarily entail opposing the goal.